As a long-term Gmail user, my favorite quirk was the customized Google ads generated by the context of your email. "He's Just Not That Into You: Buy NOW on Amazon.com!" "Don't Quit Now: 10 Surefire Ways to Win Back Your Man." "Are the Stars Aligned for Romance? Get Your Love Astrology Charted TODAY." Just one more way overzealous commerce can teach us not to take ourselves so friggen seriously. Combine all ingredients in a sealed glass or plastic container to marinate. Refrigerate at least two hours or preferably overnight. Stir or shake occasionally to evenly coat. One hour before serving, stir in cilantro. Serve on a bed of torn lettuce of your choice. Garnish with quartered cherry tomatoes, Thai bird peppers and cilantro sprigs. 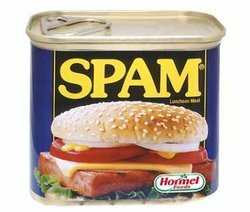 First off: Dude, I like Spam as proudly as the next Hawaiian, but Spam SALAD? As in cold, marinated, shredded Spam? That's commitment! Imagine the trial and error involved in creating this recipe. Shudder. Second: Did anyone clock that this recipe serves one? Cold, shredded Spam for one. It's the saddest effing thing I've ever seen. Never before has there been a more apt or poignant food metaphor for loneliness. Third: If you have the where-with-all to have Thai bird peppers, "Oriental" (snicker) chili powder in your pantry, and fresh ginger, red onion, limes, lettuce, cherry tomatoes and cilantro in your fridge, don't tell me that you couldn't come up with anything but Spam salad to eat. Heat oven to 350'F. In large bowl, combine potatoes, cheese, sour cream, and soup. Stir in SPAM, bell pepper, and green onion. Spoon into 13x9 in. baking dish. Sprinkle with crushed flakes. Bake 30-40 minutes or until thoroughly heated. Let's count processed food MVPs, shall we? This baby's primary source of protein is Spam; the bulk of the casserole is thawed french fries (?! ); it relies on the classic be-all-end-all binder, canned cream of chicken soup; AND, to bring it on home, it's topped with crushed corn flakes, presumably for casserole camouflage. Words fail me. I can do nothing but applaud the genius who figured out how to feed 8 people with the gnarly odds and ends lurking in dark corners of their pantry and freezer. BRAVO! I almost want to say: Phuck the cornflakes. Go with crushed potato chips, French-Fried Onions in a Can, or smashed Potato Sticks. Get rid of the "real" shredded cheddar cheese and sour cream, and replace with Velveeta and inflammable fat-free sour cream. OWN the scary. FRENCH'S® Potato Sticks make a tasty, crunchy bed for a thick, juicy steak. Offer a crisp change of pace at the salad bar. Add FRENCH'S® Potato Sticks! Crown baked potatoes with chili, cheese and FRENCH'S® Potato Sticks. You have my GRAH TI TUDE. Ok, you gotta start putting up calorie count with this. i am scared of the number.